For diehard sports fans, catching all the action in a given week while keeping tabs on your favorite teams can feel like a full-time job. It eats up huge swaths of your free time and a good chunk of your monthly budget, too, since special cable bundles and game day packages aren't cheap. 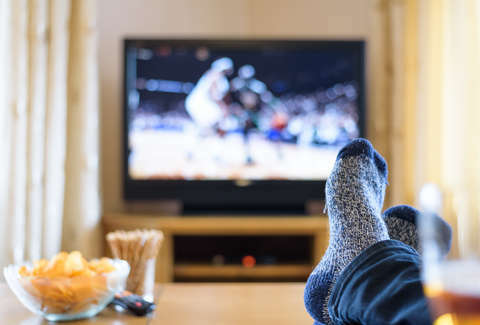 It turns out, though, that fanatically tuning into football, baseball, basketball, and more from the comfort of your couch could actually earn you some extra cash, thanks to a new gig that promises to pay $25 an hour to watch the sports you'd be watching anyway. The new dream job is being offered by the site Streaming Observer, which is looking to a hire a professional sports junkie who it'll pay $25 an hour to kick back and watch their favorite sports using a variety of already-paid-for streaming services and devices. In other words, whoever lands the gig will rake in a cool 40 cents a minute at home to watch sports they don't even have to pay for see. As SO's resident sports fan, you'll be tasked with streaming games for 10 or more hours every week for the next few months via various services and devices, while taking some notes and collecting data on your viewing experience (they'll provide you with specific guidelines on all that). You'll also be asked to snap an occasional photo or video of yourself on the job. Seriously, it's that simple. Of course, since this is technically a job, there are a few necessary qualifications to keep in mind. You need to be at least 18 years-old and a United States resident, and have a reliable internet connection. Also, you need to have a TV, smartphone, and computer, and, well, be obsessed with sports. If you're interested, simply shoot an email to jobs@streamingobserver.com with "Sports Junkie" in the subject line, and explain why you deserve to be picked for the role. And, hey, if you don't make the cut this time around, there may very well be another chance to cash in on your binge-watching habits, as other sites have recently been hiring people to do just that.